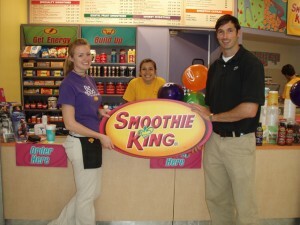 Smoothie King specializes in the production of fresh smoothies and is based in Louisiana in the US. Apart from smoothies, it also has supplements and snacks in its product line. Smoothie King was founded in 1973 by Steve Kuhnau. The inspiration came from his allergies to wheat, nuts and dairy, and his low blood sugar. During the late 1960’s, he started doing experiments using different fruits and other nutrients. Finally, he came up with great recipes that were delicious as well as rich in nutrients and did not contain any milk products. Extra protein, minerals and vitamins were added in them to make it healthy. Drawing from his experience as a soda jerker and a nurse at Brooks General Hospital, he applied what he learned about the effects of nutritious food on health. When he combined his experience with his new innovation, Smoothie King became a real success. The first Smoothie King store was opened in Kenner, Louisiana, and was named Town & Country Health Foods. It was initially a health food store, which later developed into one of the largest smoothie businesses in the US. Due to its immense success in Louisiana, it expanded the business to other parts of the country. As part of the expansion, new stores were opened in Baronne Street in New Orleans, Washington DC., and eventually 32 other states in the US. In 1989, the company started selling franchises. The company successfully completed 30 years in business by 2003. The same year, it started its expansion internationally, and the first international store was opened in South Korea. Today, the company operates in 600 locations around the world. It still uses fresh ingredients and traditional recipes created by Kuhnou producing nutrient rich smoothies. In 1989, Entrepreneur Magazine listed the company as the number one franchise in the smoothie category and would go on to win the award for the next 16 consecutive years. Steve Kuhnau, the founder of the company is its current CEO. His wife, Cindy Kuhnau is the current President.